Surf’s up! Hit the beach and start a luau with the Hawaiian Acoustic Guitar from Recording King. The Hawaiian features an idyllic beach paradise where surfers chase world famous waves and cruise ships get ready to dock. No detail was spared in making this guitar an authentic original. This is a great guitar to take to the beach and start a party. Each package features original box art and comes with a delicately embroidered guitar strap, songbook, and a signed certificate of authenticity. World-renown for designing guitars for heroes such as Roy Rogers, Dale Evans and Gene Autry, designer Greg Rich is a leader in reviving the cowboy guitar tradition. The tropical Hawaiian summer is right in front of you when you have this Recording King guitar within your reach. The Lucida Spruce Top Classical is available in a package that includes everything you need to get started. 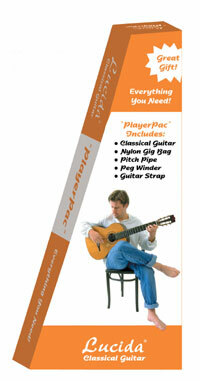 The Lucida PlayerPac includes the LG-520 guitar, a padded DuraGuard bag, Pitch Pipes, Peg Winder, and Guitar Strap. List price $139. Guitar Safari Price,$99.00 while supplies last!